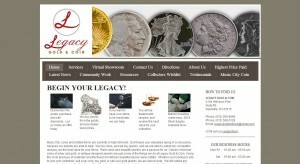 Legacy Gold & Coin address, phone, website, hours of operation, and more. Legacy Gold & Coin was formed in 2013 by Taylor Fraley and his partner Chelsey Wallen. We are able to help by offering Nashville the best option when dealing with rare coins, jewelry, and precious metals. We are dealers that have a combined 20 years in the industry. We have helped thousands of collectors either find pieces for their collection, or provide the best value for items when ready to sell. Now we’re ready to help you. Call or visit today. Taylor Fraley has owned and operated a Rare Coin Store for over 6 years , and has now brought his services to Music City. A numismatist and appraiser of estates by trade. Taylor has a Bachelors of Business degree from the University of Cincinnati. He is an active member of the community volunteering with both Habitat for Humanity, and St. Judes. He is a member of the ANA, and numerous other coin associations. The company is BBB rated, we are also members of the ANA, NGC, ICTA. We are also members of coin associations in Tennessee.